A prominent human rights defender in Tanzania, Dr Hellen Kijo-Bisimba, has raised five key questions on the government’s motive to immediately put on payroll 258 doctors who had been shortlisted for jobs in Kenya. 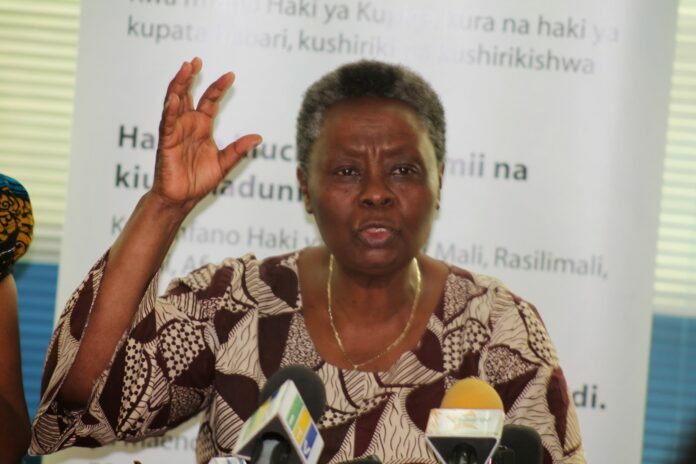 The country’s President, John Magufuli, has officially “decided,” according to the Health Minister, Ummy Mwalimu, that the process to let the doctors go to Kenya be stopped, saying the medics should instead be immediately deployed in the home health facilities. It’s here that Dr Kijo-Bisimba, the Executive Director of the country’s Legal and Human Rights Centre (LHRC) poses questions which she posted on her official social media platform, asking the public if there was anyone in a position to come up with [real] answers. That was soon after news broke, about Dr Magufuli’s turnaround decision. Read: Magufuli orders recruitment of 258 doctors intended for Kenya hospitals. Kenya requested for 500 doctors from Tanzania in March this year, in an effort to mitigate the effects of the doctors’ strike. The request was granted and the doctors were expected to leave for Kenya, this April. Yet, there is also a pending court order in Kenya that bars the country from hiring foreign doctors. Now, the human rights activist, Dr Bisimba, wondered [in unofficially translated version from Kiswahili], “I don’t know why I am haunted by such mind-boggling questions? Firstly; it’s about these doctors who had applied to go to work in Kenya. Was it because there were no jobs back in their home country [Tanzania]? Or was it because the doctors didn’t want to remain and work in Tanzania? And, now that they are being given jobs [here in Tanzania], is it to be regarded as a reward to them for responding to the government’s call to go to Kenya? What if the doctors didn’t show up to apply for the jobs to work [in the neighboring country]? What would have happened? Does the government really need the doctors, or this scenario means showing a sign of appreciation to those who applied? If the government really needs the doctors, what’s the fate of those [medics] who didn’t apply to go to Kenya but are still unemployed? 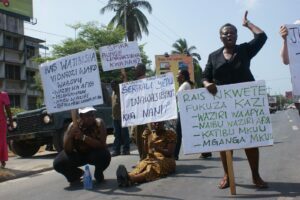 Picture showing Dr Hellen Kijo-Bisimba(right) in 2012 in Dar es Salaam, holding a placard–alongside other activists–with a message that called on former President of Tanzania, Jakaya Kikwete to hold to account government leaders in his administration who had been accused of failing to address doctor’s grievances, leading to a nationwide strike. Dr Kijo-Bisimba’s recent queries come at a time when her country is facing budget constraints in efforts to provide employment to health workers it has trained. Now that the government has decided to employ the 258 doctors, more questions are being raised about where the money will come from to pay them. But also, there is acute shortage of doctors in health facilities across the country. Tanzania needs about 3, 510 doctors to be distributed in various referrals hospital at the regional and district level, according to the Task Sharing Policy Guideline for Health Sector Service of 2014 which will end in 2019. Yet, the Health Minister, Ummy Mwalimu has publicly admitted that following government’s Wage Bill, the 1000-young doctors who graduate every year in the country cannot be put on payroll in state-health facilities. “We now have over 2000 doctors who are not yet employed in government-run health facilities over the past two years,’’ she said at a press conference in Dar es Salaam early this year. Next articleEast Africa: When ‘heart-broken’ scientists stop talking to journalists; who will intervene?